Okay, okay – hear me out. I know what you must be thinking – bacon on a cheesecake? What the what? But just trust me, it works, especially since its beer-candied bacon. I first got this idea for a cheesecake at my favorite place for inspiration, Dogfish Head Brewings & Eats. In the spring months here on Delmarva, they have a restaurant week. If you are a restaurant in the area and would like to participate, you can offer a 3-course meal to your patrons for $30 a person. We’ve been to a few places, as it’s always fun to try something new, but we always end up back at Dogfish. There’s the amazing beer, obviously. But, the food is always awesome – as well as the service. It’s a great place to go with the kids, with fun activity menus to keep them busy. They even make their own homemade birch beer! They source as many local ingredients as much as possible, displaying the farms proudly on a chalkboard. Sam and his wife Mariah (founders of Dogfish Head) are the nicest people in the world. We’ve seen them in there many evenings where their family was enjoying dinner with friends, or just hanging out – and Sam chatted with Jon about homebrew for a while. They also host our local homebrew chapter, Delmarva United Homebrewers, at the brewpub in the winter months. Which, is just another notch on their lipstick case of coolness in my book. Okay, I digress…let’s just say that I love them, and everything that they stand for. The cheesecake was on their prix fixe menu that night as a dessert choice. Of course I couldn’t resist, and I’m eternally grateful that I didn’t. They used their Chicory Stout in the batter, which led to a denser cheesecake than I was accustomed to. It definitely stuck in my mind, and I always wanted to recreate it at home. Enter Jackie, who posted a chocolate stout cheesecake on her beer blog a while back. I knew it was going to be the perfect base for this monster. And, it was. I added a bit of the beer-candied bacon to the batter, as well as to the top (along with some hot fudge sauce to make it easier to adhere). Just enough to make you think – Oh, bacon! And the pretzel crust? Insanely good, and seemed to retain a better crunch than your standard graham cracker variety. Place one oven rack in the middle position, with one rack below. Preheat oven to 350. Spray the inside of a 9-inch spring form pan with non-stick cooking spray. Pour the processed crumbs into the spring form pan. Using the bottom of a heavy, flat bottom glass, press the crust very well into the bottom of the pan until well compacted. In a pot over medium high heat, add the beer and the chocolate, stir until melted and remove from heat. Allow to cool. In the bowl of a stand mixer fitted with a paddle attachment, add the cream cheese and the sugar and mix until smooth. One at a time, add the eggs, scraping the bottom of the bowl between additions. Pour the cooled chocolate into the mixer and beat until well combined. Lift the head of the mixer and add flour, cocoa powder, espresso powder, and bacon over the batter, stir on low speed until just combined. For the topping, warm your hot fudge sauce so that it is pourable. Pour onto the center of the cheescake carefully, and allow to sit and solidify for 15 minutes. Top the chocolate with the chopped bacon. In a stand mixer fitted with a whisk attachment, whip the whipping cream until soft peaks form. Add the sugar, and continue whipping on high until stiff peaks form. Place in piping bag fitted with a decorative tip (I used Wilton 2D) and pipe border of whipped cream around the edge. WOW! That looks incredibly fantastic. Beautiful job 🙂 Seriously, wow. the pretzel/graham cracker crust alone is making me hungry. 🙂 bacon and beer in desserts is something i haven’t tried to make myself yet but i had a guiness stout chocolate pound cake once that was to die for. What a unique and yummy combination! I love the idea of beer-candied bacon on my cheesecake. Does that mean I can eat it for breakfast? Thanks! Cheesecake is an always acceptable breakfast in my book! It has eggs, bacon, wheat (just like bread! ), espresso powder, sounds like a good breakfast to me! Your pictures are beautiful!I am a HUGE dogfish head fan and visit (and drink) it often. My husband is also dabbling in home brewing. Is there a schedule for the meetings? Please remember when writing recipes that not everybody has a stand mixer. Thanks. I trust most of my readers, at the very least, have a hand mixer. That could certainly be used in place of the stand mixer. Make this cheesecake with a whisk if you have to, it’s fabulous! I just made this with a hand mixer and it worked out just fine. It’s in the oven now! Can’t wait!!! This looks amazing! Can”t go wrong with Dogfish Head! One question: the ingredient list for the crust calls for granulated sugar, but the instructions say to use brown sugar–which sugar are you supposed to use? Hoping to make this for a SuperBowl party! Thanks for sharing, excited to try lots of recipes on your site! My bad, brown sugar was in the original recipe – and I changed it to granulated. Either would work, but I used granulated. Going back to change that now, thanks for the heads up! 1. When it says 1 cup pretzel rods, does that mean already crushed? 2. Can this be made a day ahead? If so, would I wait until right before serving to top with the bacon? I don’t want it to be soggy, for sure. Yes, 1 cup crushed pretzels – it’s probably about 15 rods. And yes, it can certainly be made a day in advance. Wait til the day of to top with bacon. Do you think this recipe would work if I converted it to cupcakes? Also, do you have any idea how long I would bake them? I’ve heard of other people converting cheesecake to individual servings in the past, but haven’t had experience with it myself. Maybe start checking for doneness after 25 minutes? I bought graham cracker crumbs…about how much does 4 graham crackers make when you grind them? I’m guessing about 1 cup??? I love cooking with beer and can’t wait to try this!! Such a great idea!! I just stumbled across your website and man am I in love!!!!! So many awesome dinner AND dessert recipes I want to try!!! Thank you! I can’t wait to eat this!!! It is in the oven as I type this!! However, it has been baking for close to an hour and 15 min and is still jiggly….am I doing something wrong? Im worried about the crust burning…Thanks again for sharing! Really hoping it turns out like yours!! I’ve found that cheesecake cooking time varies from oven to oven. I’ve cooked one close to 2 hours before, and had no issues with the crust burning. I’m sure it will turn out delicious! This chocolate cheesecake recipe looks amazing and it’s worth a delicious try! My daughter made this! It was DELICIOUS! Thanks for the recipe! wow. bacon and cheescake together! how sinful is that?! yum. For my boyfriend’s 40th birthday (tomorrow), I’d decided to make this cheesecake to please my carnivore. Instead of making one big cake, I converted this recipe into 36 cupcake size mini cheesecake. While making the hot fudge now, I finally just had the first bite of the actual cheesecake….oh my….this is exactly how I dreamt of heaven to be like!!! Just the cheesecake along almost sent me over the moon, can’t imagine what’s gonna be like when it all comes together with the fudge, bacon topping, and whipped cream. I want to make this for my beer and bacon loving dad for Father’s Day. A few questions – first, my dad loves intense dark chocolate, so do you think you coul use a darker percentage of chocolate and still get a good effect? Secondly, I don’t have a standing mixer, so can I mix the cream cheese and stuff by hand and then use a hand mixer to mix everything smooth? Thanks! I had the cheesecake at Dogfish last summer. I didn’t think it was very good. Overall, it just had a really odd flavor. Not enough chocolate, and the beer – don’t know if it was the type or amounts – just didn’t work with the bacon flavor. Maybe they have improved the recipe, but the one I had I could not finish b/c it was so bad. A shame, but it sounded like it would be really good. Cal, I’d have to agree with you there. The first time I had it (during restaurant week when it was still a “special”), it was amazing. But since it’s been on the regular menu – it’s changed. No chocolate drizzle or candied bacon. Just overall kind of lackluster. But, I’m usually so stuffed I don’t even bother ordering dessert anymore. We go often in the off season, and I’ve never had a bad meal there. Trust me on my version of the cheesecake though. It’s the perfect balance, and candying the bacon helps to bring all the flavors together and muddles some of the porkiness. This cheesecake was amazing! Thank you for the recipe! I used Rogue Double Chocolate Stout. The whole thing came together fantastically. So much Chocolatey and bacony goodness! Even better the second day in my opinion. I love baking and cooking with stout this cheesecake sounds heavenly! What a great combination of flavors. I think I have a couple of bottles of stout so I can see this recipe in my future. Thanks! I have the cheesecake in the oven now! I’m excited but I just went back and looked at your picture and it looks like the crust comes up on the sides when the directions say just to put it on the bottom. Now I’m nervous that the cake will stick to the sides! Also, when can I remove the sides if the spring form pan? After adding the fudge topping? It should unmold just fine, make sure to run a pairing knife around the outside edge first before removing the springform pan. I usually remove it before adding the hot fudge, but it’s fine to do it afterwards too. I’m in love with this recipe and can’t wait to make it tonight to bring for Christmas tomorrow. The only item I wanted to clarify — the cocoa powder used isn’t “unsweetened”, correct? Amanda, most of the cocoa powder I used is unsweetened. I made this yesterday for my anniversary. It’s delicious!! I didn’t have graham crackers so i didn’t an all pretzel crust which I think I like better! I do have a couple complaints, though. First, it took closer to two hours to cook; luckily I had that time to wait. Second, it has a weird crust on top. I’ve never made cheesecake before, so maybe this is normal, but ive never experienced it on any cheesecake I’ve eaten. I would definitely make this again. The beer affects the appearance of the cheesecake, Kim. Mine looked a little funny on top too, but once you cover it with hot fudge sauce and more bacon, you can never tell anyways. Glad you enjoyed it! Looks wonderful! Do you think it would be possible to let the cheesecake cool, then freeze until ready to add chocolate (I might try a ganache on top) and the candied bacon? Can the candied bacon be made more than a day in advance of use? For the cheesecake it can be made up to 3 days in advance. It would probably be alright to freeze first, but I can’t say for certain as I have no experience freezing cheesecake. Sorry. We had this when we went to the Dogfish brew pub it was OUT OF THIS WORLD. Thank you for posting the recipe!!! I am making this now, as I type it is in the oven. I decided to try a locally brewed vanilla stout as I was leery of regular stout’s bitterness. You didn’t specify how long to chill this before decorating. Also I think you should have increased the bacon to about double to account for taste testing(my kids and grandkids couldn’t stop eating the bacon) I will let you know how it turns out. Well, this cake came out AMAZING! I made it as a test run for a wedding and everyone loved it. I am making about 6 different cheesecakes for the wedding but I am sure this one will be the favorite of them all. Awesomeness pictures! I am obsessed with desserts! Definitely bacon stout chocolate cheesecake will be yummy! I’m seriously so inspired right now. I need to add cinnamon to recipe and it would be perfect. Thx for sharing Laura! This cake is a man-magnet! Every guy at a “cake fest” I participated in was clustered around my cheesecake waving their fork and saying, “I’ve got to try this!” I used an 8 1/2” springform, cooked it 80 minutes. Bacon never got crispy… but was nice and sticky-sweet. Used a whisky-barrel stout for the bacon and a double-chocolate stout for the cake. 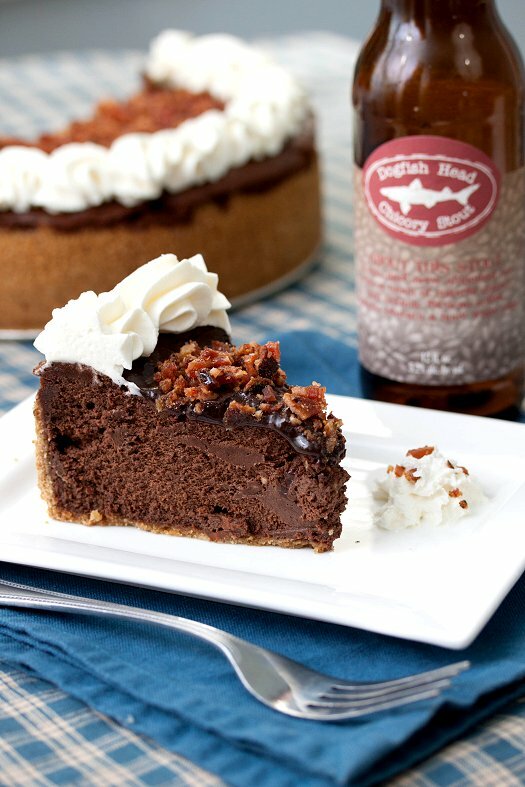 This bacon stout chocolate cheesecake just looks SO incredibly delicious and I am so craving a slice right now!